One of the best things about all of the challenge blogs, is I'm constantly finding new ideas. 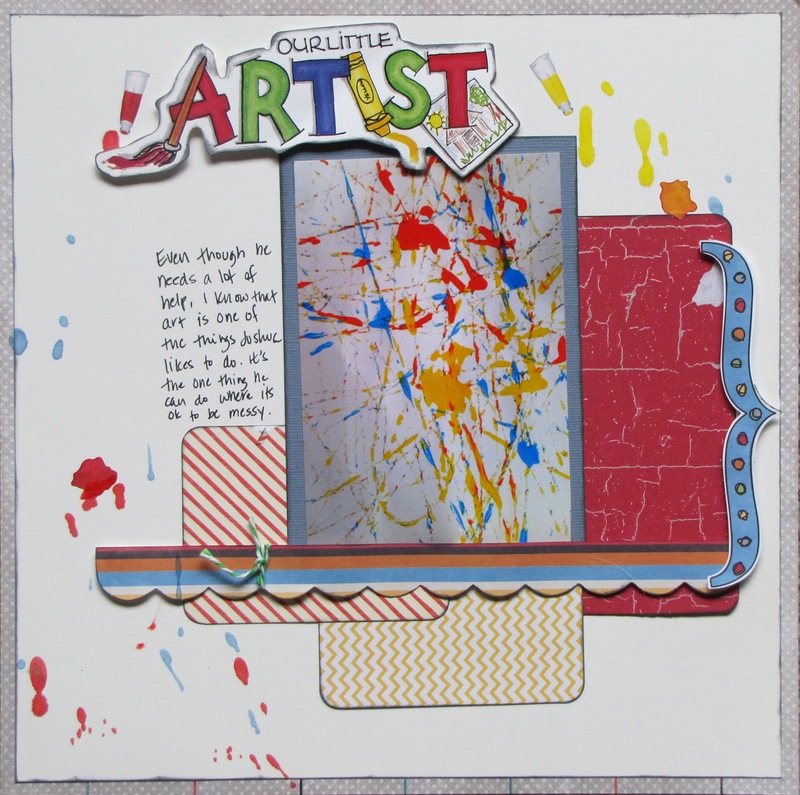 Case in point, today's new challenge at About a Boy: Use your son's artwork on your page. I probably wouldn't have done this without some prodding, at least not right now. So here it is. My younger son made this a few years ago. I know he had a lot of help, but I like that it feels like him. And I know he likes paint. For some reason, I decided to take a photo of it instead of keeping the original. I've only done that a few other times. I wanted to keep the focus on the photo. I decided to use grey as a neutral and kept it simple with small patterns and similar colors from the photo. I did bring in some contrasting colors because it was looking blah. The green and the orange helped bring the focus back to the photo. I also have to say, that thanks to this assignment, I was able to use something I've had in my stash for a very long time...the title. Lastly, I had to use paint splatters, didn't I???? That's all for now. I hope you will stop by About a Boy and try your hand at scrapping your son's artwork. Loved your take on this challenge. I am having such fun with the challenges at Boys. Thanks for visiting my blog. Wow! Love your take on the challenge, great colors & layering! Also, loving the artwork! 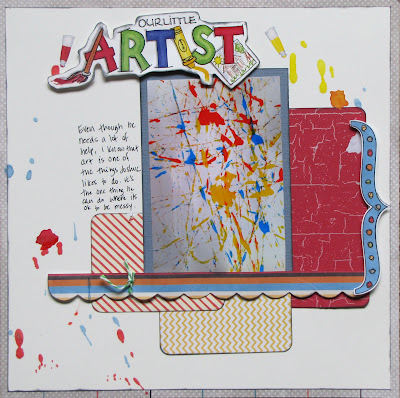 Great page - love your choice of patterns to surround his artwork. I just recently gave away the last few titles I had like that - at least I think they are all gone. I recall that I bought dozens of them when they were on clearance for a nickel and probably didn't use up a quarter's worth.